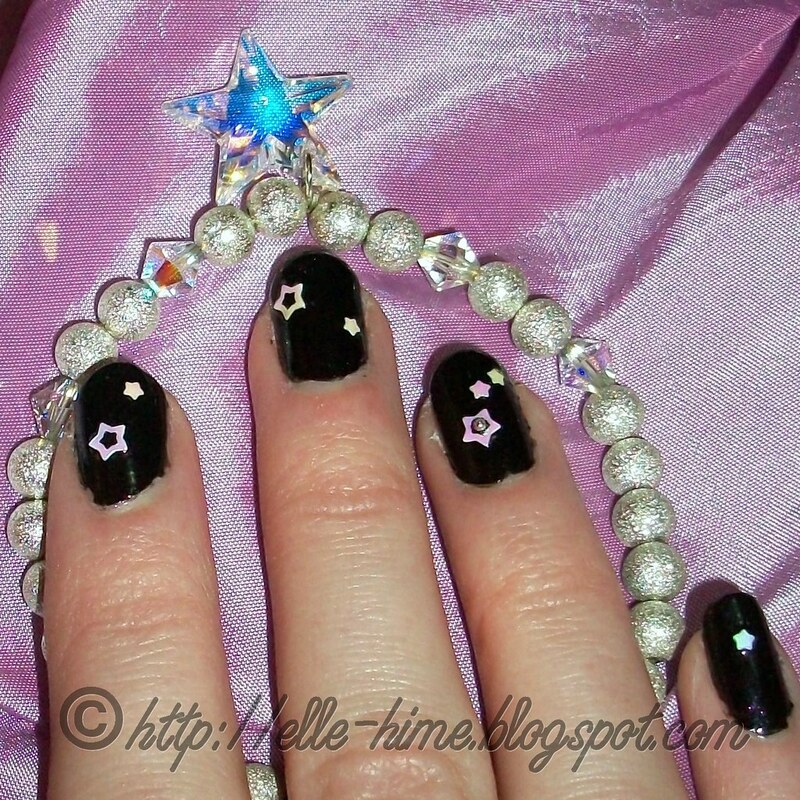 Princessly Polished: NotD: Interstellar Rock Star! 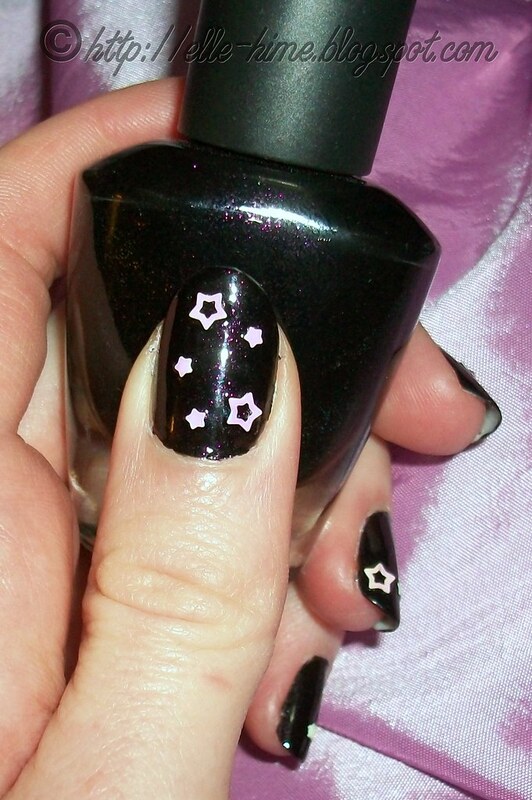 I'm currently rocking this totally awesome manicure that appeals to my love of black nail polish and cutesy, girly things. 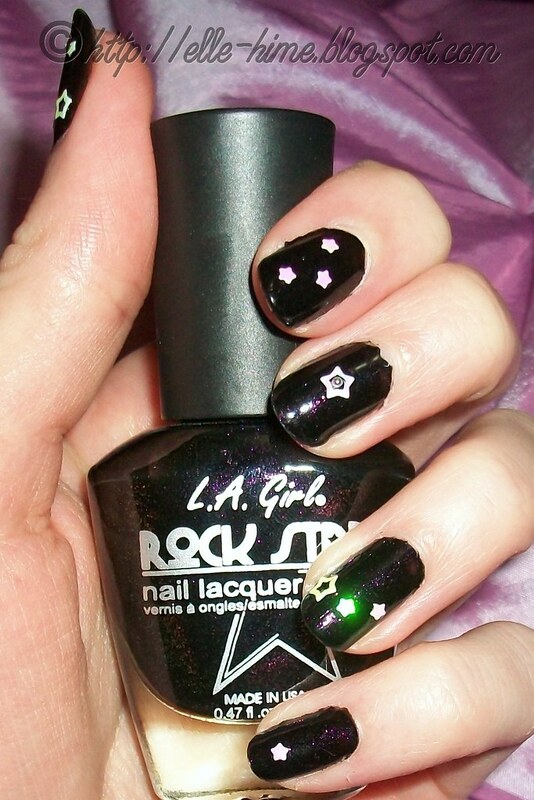 I used my new L.A Girl polish from their Rock Star Nail Lacquer collection. The color? Rockstar. It is a black polish with a jelly-ish quality that is loaded with purple micro-flake shimmer that flashes green in the bottle. I have only seen purple show on my nails, but it's gorgeous and I love it anyway. 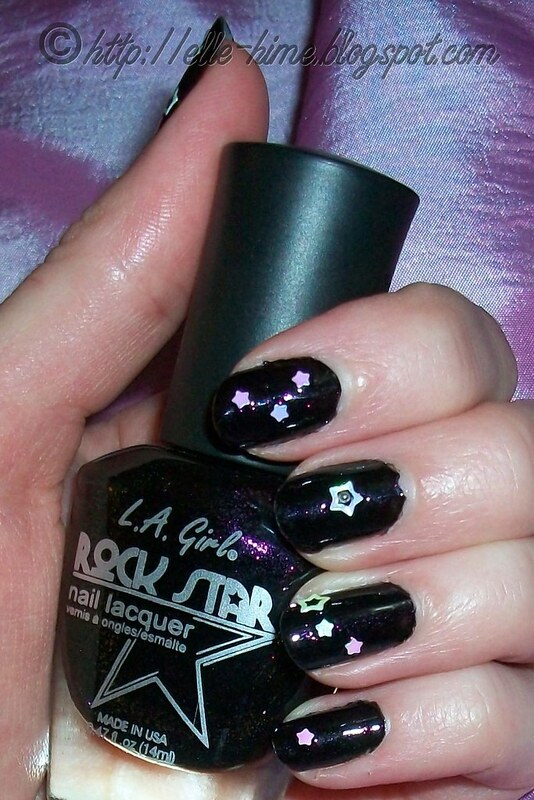 This is 2 coats of LA Girl Rockstar, which I pressed star glitter flakes (and 2 bullion balls) into while it was still tacky, and covered with 2 top coats. 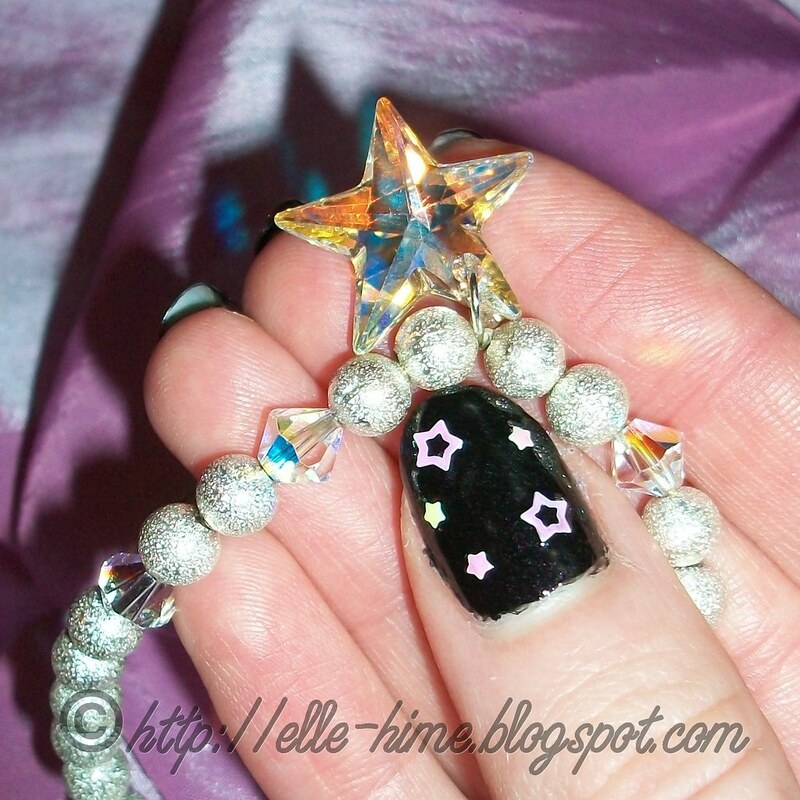 It's very glossy and the stars are very flashy, showing up as pastel purple, pink or green as my fingers move. I can't stop staring! 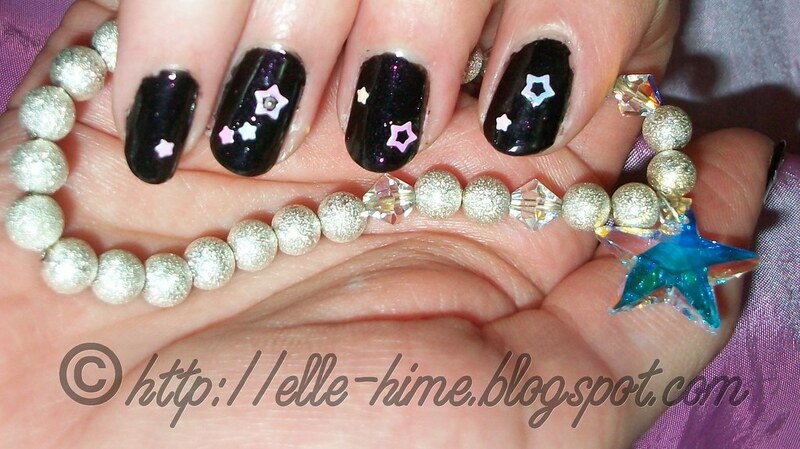 I dressed my right hand up too, but didn't mirror the arrangement of stars except for on my pinkies. I have been impressed with the quality of the few L.A. Girl polishes I bought - for only $2.50 I'm going to buy a few more. Both the brush and the bottle are nice to work with. Hopefully it lasts through the weekend! withdraws on the money as you'll need it, then make payments back in to the account. familiar making use of their tactics said. is basic and 100% secure loans for bad credit as in, you will find few other choices but to use for any loan. well as high redemptions from tax refund. submit an application for these loans and you also receive the cash instantly. could possibly be able to obtain relief with an investment property loan modification.